PracticeCompass stands for integrating with other state-of-the-art systems to provide the best opportunities for its clients. That way we create the best working conditions for practices and help them simplify and automate all of the work processes to make them extremely efficient. 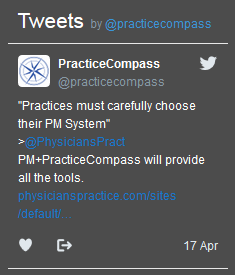 The combined application of these platforms and all of the features of PracticeCompass enable practices to organize the workflow from the very beginning to the very end in the most efficient way, as all aspects of the business process are controlled by you. Therefore, you are able to become much more competitive after seeing allareas that need improvement. Integrating with Marketing Exchange Platform helps our clients find additional sources of acquiring new clients by finding and buying the best advertising campaign based on your target audience. PracticeCompass then helps you see the statistics of that advertising campaign and monitor Return On Investment. We help your practice grow and improve constantly.